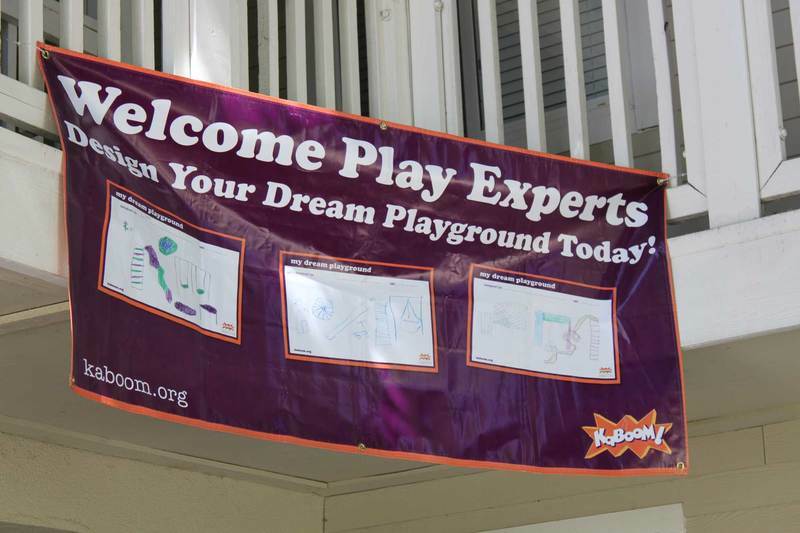 Kids' activities on Design Day | Playground build toolkit | KaBOOM! 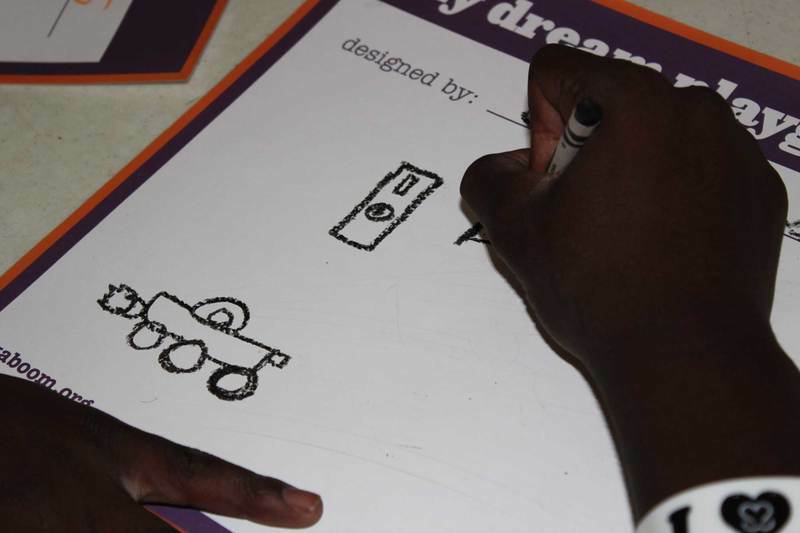 Design Day has one main objective – to elicit design input from the kids who will actually use the new playspace. What would their ideal playspace look like? This is their time to dream beyond the horizon, flex their creativity, and have an immediate, tangible impact on the course of the project. But as long as you have those kids and their parents gathered together, take the opportunity to fast-forward your other team goals as well! Design Day is a great platform for recruiting new volunteers, soliciting in-kind donations, and launching greater youth involvement. As children's team captain, you'll be responsible for making sure that there are plenty of children present, and that their participation is organized and productive. Get neighborhood schools or youth organizations involved, and set up fun contests or incentives. Spread the word and aim to have at least 25 kids participating. Some communities have pulled off Design Days with whole schools completing drawings! The key is having adequate adult supervision. Recruit one to three children's moderators (you can include yourself!) for every 25 kids. Good moderators are creative and work well with children. Secure crayons, paper and any other materials. How many children can you handle at one time? Will all the children be able to draw and present individual playspace pictures? Will there be a discussion or a vote to choose the favorite designs? Will there be prizes for "most creative drawing," "most fun playspace," etc.? Will your play equipment representative be present? What role will he or she play? If the representative cannot be present, how will the children's design ideas be communicated to him or her? It's important to create an atmosphere in which children feel comfortable expressing themselves. This applies to the physical setting for Design Day as well as your choice of moderators - if you can, try to recruit a familiar face (perhaps a teacher). If you let parents look over their children's shoulders as they draw, you'll get a lot of pictures of traditional playground structures. This is your chance to find out what kids really want, however impossible it may seem - castles, jungles, rocket ships, race cars, and so on. For the same reason, don't show the children any play equipment catalogs before they begin drawing. It's also important to separate children from one another to some extent so that they produce individualized pictures that really reflect their imaginations and dreams. Are you alone? Who are you with? How tall is your playspace? What's around it and next to it? Are you playing games? Which ones? Check out some game ideas here! Make sure you explain the general purpose of this activity: designing a new playspace! When the drawings are finished, lead a discussion session in which each child presents his or her work; this will make them feel important and it will help you decipher their deepest wishes. Just as importantly, make sure that their great ideas don't go to waste! Children who see their visions manifested in the playground design will feel a lasting sense of pride and ownership. Obviously, incorporating their wishes isn't always straightforward — if kids are truly allowed to be visionary and idealistic, they'll come up with a lot of seemingly impossible ideas. You'll need to explain that individual ideas may or may not be used, but that each child's input is important. This is where your play equipment company might come in; they can often find ways to translate the spirit of those playspace drawings into real playground design. For examples, check out this incorporation chart.